Thousands of pristine and blue lakes have appeared in the eastern portion of Antarctica, scientists have confirmed. According to a new study published in the Geophysical Research Letters, “supraglacial lakes,” which consist of meltwater, are formed via the warmth of summer as it heats the tops of glaciers. This phenomenon was observed in Greenland. Nearly 8,000 of them were mapped from data gathered during the summer months between 2000 and the year 2013. According to the authors, the melted water from the lakes filters down through the glacier and affects its foundations, which will denature the glacier’s integrity even more. A trillion tons melted off Greenland’s ice sheet between 2011 and 2014, another study in June found. 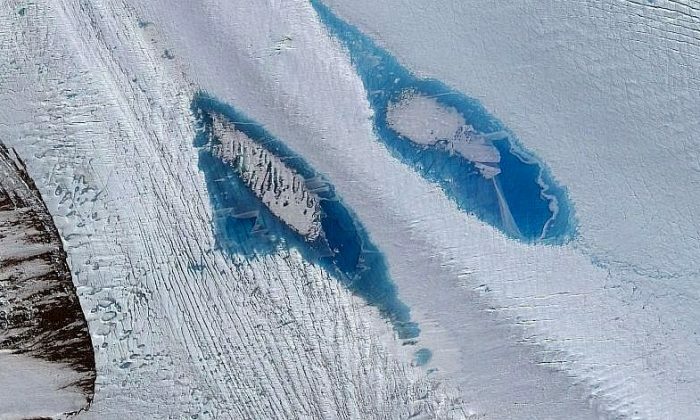 The phenomenon of meltwater lakes is being observed in Antarctica at an increasing rate, according to the Washing Post. The study used satellite images to observe and analyze the Langhovde Glacier in East Antarctica’s Dronning Maud Land. “The parallels between these mechanisms, and those observed on Greenland/the Antarctic Peninsula, suggest that lakes may similarly affect rates and patterns of ice melt, ice flow and ice shelf disintegration in East Antarctica,” they wrote. The authors said there is a strong correlation between surface air temperatures and the formation of these lakes, which formed when temperatures rose above 32 degrees Fahrenheit (0 degrees Celsius), and formed most frequently in the summer of 2012-2013, which experienced 37 days of temperatures above freezing. Jamieson said that “the maximum number of lakes, and the total area of the lakes, as well as the depth of the lakes, all of these things peak when the air temperatures peak,” according to the Post. However, it’s yet to be seen if the Antarctic lakes’ formation will have the same impact as the lakes that formed in Greenland. “We do not think that the lakes on Langhovde Glacier are at present affecting the glacier, but it will be important to monitor these in the future to see how they evolve with surface air temperature changes,” study co-author Emily Langley told Gizmodo.